The organisers of the 2018 Ikateleng project are confident it will continue to bear fruit in communities. Ikateleng, a Setswana word which loosely translated means “empower yourself”, is a flagship project of North-West University (NWU) and agricultural group, NWK Limited. The launch of the 2018 Ikateleng project in Lichtenburg on 24 March 2018 coincided with the sixth anniversary of the partnership between the NWU and NWK. This year will see 250 learners from Coligny, Bodibe, Itsoseng, Mahikeng, Lichtenburg and surrounding towns benefit from the programme. 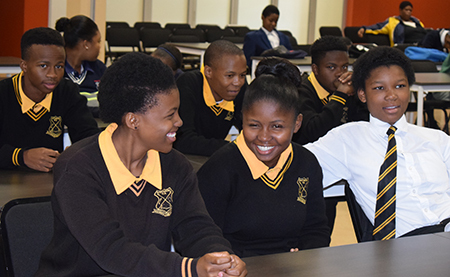 Learners from Grade 10 to 12 will receive supplementary classes over the next 16 weeks with a particular focus on accounting, mathematics and physical sciences. Johan Bezuidenhout, NWK’s group manager for corporate marketing, says the Ikateleng project is a big opportunity for learners. According to him, those learners who take part in the Ikateleng project, performed much better academically than their counterparts. The NWU’s Darius Mhulatshi echoes Johan’s view, and adds that learners in the programme had achieved an 88% average pass rate over the years. “We want to enable these achievers to qualify for merit bursaries to alleviate the financial burden of further studies,” says Darius. These learners are looking forward to participating in the 2018 Ikateleng project.